TRRP channel rehabilitation sites use a combination of features to encourage a more dynamic natural river channel and to jump-start needed salmon habitats. Physical channel processes respond to changes in flow regimes, sediment supply, large wood supply, channel confinement, slope, grain size, and other controlling parameters. Channel rehabilitation construction is only the beginning, each site is expected to evolve over time with restoration flows as fluvial geomorphic processes, such as sediment transportation and redistribution and increased river sinuosity, are re-established. This page briefly outlines several common features that are constructed at TRRP channel rehabilitation sites. Specific constructions of these features will vary and may be placed to interact with other features in complex ways that are not covered here. TRRP has written a design guide that covers each of these features in greater detail. The Trinity River Flow Evaluation Study and the Record of Decision provided an overview of the channel rehabilitation strategy, yet few specifics on channel dimensions. TRRP was established as an adaptive management program, which allows rehabilitation strategies to improve as the Program progressed. Whether by strict Adaptive Management procedures or by general improvements to scientific understanding of river rehabilitation, new information and approaches have been developed since the ROD was signed in 2000, offering substantial improvements in the ROD goals of increasing and improving salmonid habitats. Incorporation of macro-topography and micro-topography into newly created floodplains, including high flow scour channels, lower benches for fish habitat and natural riparian regeneration, as well as constructed terraces for spoil materials. As information continues to improve, TRRP’s use of features discussed here may further evolve. Channel rehabilitation work at the Bucktail site in 2016 reconnected the river with its floodplain. Many of the floodplains on the Trinity River were disconnected from the river and altered dramatically by dredger mining. Dredgers removed the top soil and mixed and inverted floodplain sediments to a depth of up to 40 feet. Dredger mining often removed the surface expression of former channels as depressions in the floodplains, buried large wood that supports certain species of riparian vegetation, top soil, and higher islands of vegetation. All these elements of the historic floodplains played a crucial in supporting productive habitat for juvenile salmonids. Given that the unimpaired Trinity River was a high-energy river during large floods, floodplains were probably topographically diverse rather than large flat surfaces typical of a low gradient, meandering, low-energy river. Due to the much larger flow regime prior to the Trinity River Division, the floodplain surfaces were substantially higher in elevation than what is currently appropriate for the smaller ROD flow regime. Therefore, the elevation of the floodplain, as well as the topographic diversity of the floodplain surface, must be designed to the ROD hydrologic regime, including the hydrology of downstream tributaries. Floodplain design on the Trinity River is predominately focused reconnecting the river to floodplains at lower flows. This is accomplished through the manipulation (lowering) of surface materials, including terraces, dredge tailings, and flattened dredge tailings. 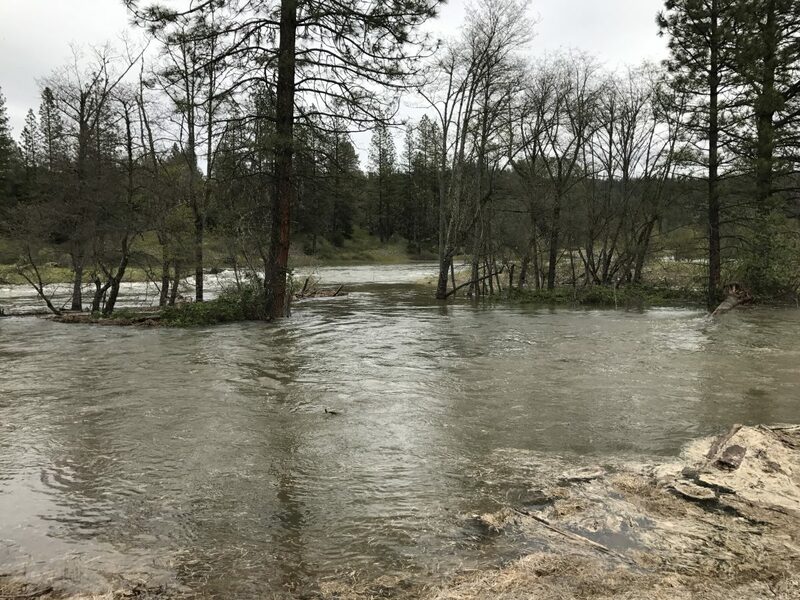 The primary design elements within a floodplain are the typical floodplain elevation, floodplain width, and floodplain channels, which may include high flow channels, high flow scour channels, winter baseflow channels, tributary channels, and/or wall-based channels. At minimum, satisfy riparian regeneration mitigation requirements through planting and natural regeneration. Maximize riparian planting area via floodplain surfaces and riparian benches. Maximize fry and juvenile rearing habitat via side channels, high flow channels, high flow scour channels, alcoves, and other topographically diverse features on the floodplain. From an ecological perspective, the more floodplain area, the better. However, in nearly all cases, existing surfaces require substantial excavation to create lower elevation floodplains that are scaled to the ROD high flow regime and downstream tributary floods. Therefore, the designs analyze trade-offs between the sometimes competing objectives mentioned above. Sawmill Side Channel rehabilitated in 2009, photographed in April, 2017. These early side channel entrance failures resulted in the TRFEFR and ROD focusing on mainstem channel rehabilitation over side channel restoration, and thus only three side channels were identified for construction. 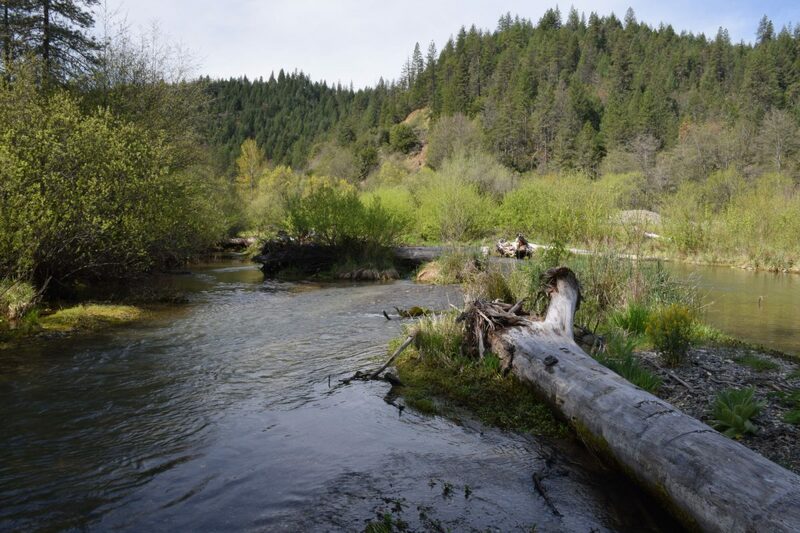 However, secondary channels (side channels, split channels, high flow channels) have become much more common in designs to their immediate habitat benefits, providing a jump-start to needed salmon habitats. Designs are considered for how the side channel entrance and exit (alcove) may avoid sedimentation. 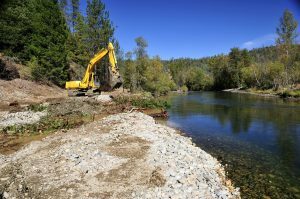 View the evolution of a side channel at the Sawmill channel rehabilitation site that was constructed in 2009. Recently constructed side channels are now known to contribute substantially to juvenile salmonid habitats (see the Juvenile Rearing Habitat page) and several are used by spawning adult salmon (see the Redd Distribution and Abundance). Like side channels, alcoves are desirable because of the fish habitat they provide, as well as the geomorphic complexity they offer. However, alcoves too, have a high failure rate due to sedimentation. Alcoves are often designed in combination with high flow scour channels on the back side of bars, contributing to additional topographic diversity on floodplains, while minimizing risk of sedimentation. Large wood is placed at a rehabilitation site to create an engineered log jam. Photo by Kenneth DeCamp. 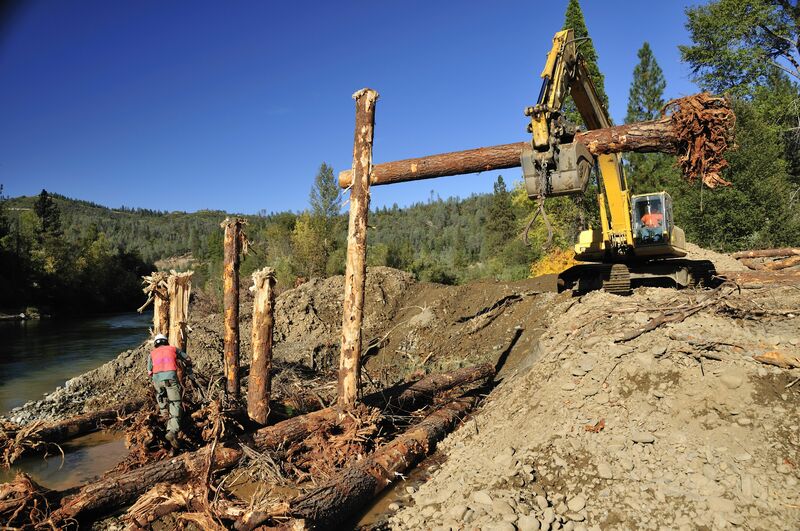 The first use of large wood in a design appeared in 2006 at the Conner Creek site, when imported root wads were placed individually at the constructed floodplain toe. The Sawmill site (2009) is the first where a substantial log structure was constructed. Recent projects such as Lowden Ranch, Trinity House Gulch, and Reading Creek (2010) included wood placed in a variety of fashions including multiple constructed wood jams. Create a desired geomorphic effect on the reach and unit scale. Create desired habitat cover and complexity. Promote channel migration and avulsion. Cause local bed mobilization and scour that helps reduce risk of future detrimental riparian encroachment. Promote island or medial bar formation. Provide a source for large wood recruitment in the future. The selection of bar type depends on site specific valley wall confinement, frequency and extent of bedrock control, type of bank materials (bedrock, floodplain sediments, tailings piles, etc. ), sediment supply, flow strength and radius of curvature. The size and frequency of lateral bars or point bars in straight or meandering channels without medial bars or islands should be tied directly to radius of curvature and wavelength (a measure of river feature frequency). Point bars or alternative lateral bars should coincide with the apex of channel bends or the proposed sinuosity of the thalweg, respectively. Medial bars or islands must be placed in locations that have an appropriate sediment supply, bankfull width, flow strength, and bank strength to maintain the features. The length of a medial bar should not exceed that of the ½ wavelength associated with riffle-pool spacing in a single thread channel. 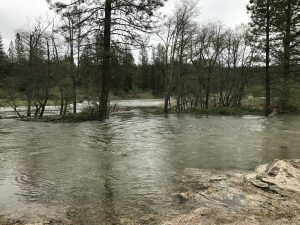 This must be done in the context of how flow regulation has affected riparian vegetation, primarily by enabling vegetation to grow densely along the low-water edge (see the overview page on restoration flows). 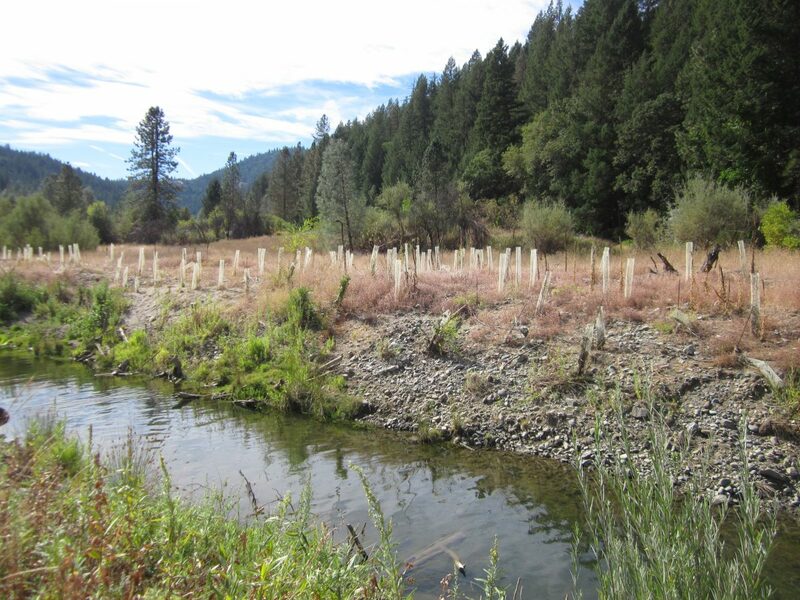 The general pattern of TRRP’s revegetation efforts is to encourage riparian vegetation at a higher elevation, appropriate to restoration flow releases. There are two ways to achieve the riparian vegetation goals, natural recruitment and revegetation. Physical designs can affect the location where plants can successfully initiate (e.g., grow from a root fragment or seed) and then establish (e.g., grow into a mature plant). Physical designs also affect the location and elevation where riparian plantings should occur via the construction of specific ground elevations, planform locations, and soil placement. Physical designs should also be able to inhibit detrimental riparian encroachment on the river channel. 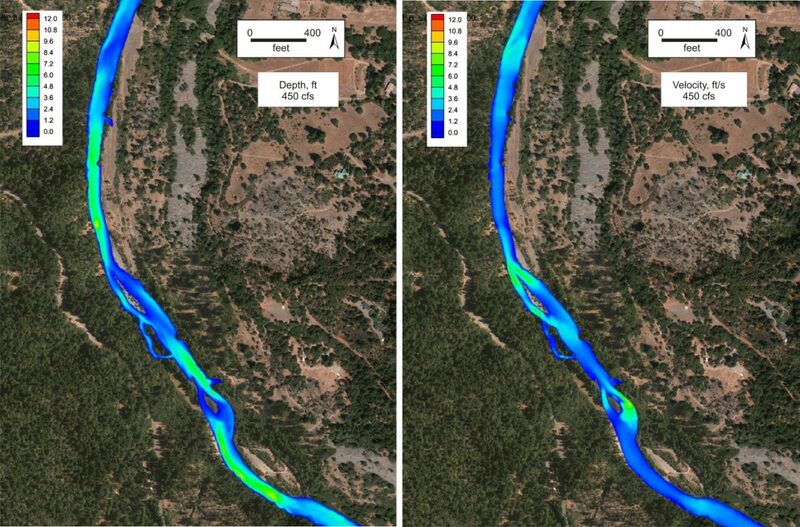 Benches at or below the floodplain exposed at different characteristic ROD discharges (e.g., 6,000 cfs, 4,500 cfs, 2,000 cfs, etc) and with variable microtopography can promote the successful initiation of multiple riparian hardwoods beyond just narrowleaf willow. Presently TRRP’s revegetation goal consists of a 1:1 replacement of riparian vegetation removed by rehabilitation site construction. The replacement goal also includes a 50/50 ratio of natural recruitment versus planting. Revegetation efforts focus on perennial species; the grass seed distributed at the end of construction is for erosion and weed control rather than revegetation. The logic supporting the overall programmatic riparian vegetation goals and objectives is detailed in the Integrated Assessment Plan and a riparian revegetation guide is under development. Success of riparian revegetation is monitored, primarily within the Integrated Habitat Assessment Project (IHAP) – see Riparian Vegetation within the Science area of the website.